Alpena County is a county in the U.S. state of Michigan. As of the 2010 census, the population was 29,598. 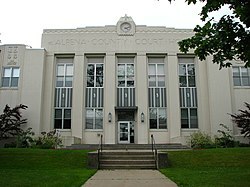 The county seat is Alpena. It is considered to be part of Northern Michigan. It was founded originally in 1840 as Anomickee County. In 1843, the name was changed to Alpena, a pseudo-Native American word — a neologism coined by Henry Schoolcraft, meaning something like "a good partridge country." This was part of a much larger effort to rename a great many of the Michigan counties at the time. Alpena County was officially organized in 1857. Alpena County is in the northeast of the mitten-shaped Lower Peninsula of Michigan. Lake Huron and Thunder Bay are to the east, Alcona County to the south, Oscoda County to the southwest, Montmorency County to the west, and Presque Isle County to the north. Most of the county is drained by the Thunder Bay River and its tributaries. The Mackinaw State Forest occupies large tracts of land in the county. The Thunder Bay National Marine Sanctuary is located offshore adjacent to the county. According to the 2000 census, the county has a total area of 1,695.00 square miles (4,390.0 km2), of which 574.15 square miles (1,487.0 km2) (or 33.87%) is land and 1,120.85 square miles (2,903.0 km2) (or 66.13%) is water. The 45th parallel bisects the county, meaning it is half way between the North Pole and the equator. Several islands in Thunder Bay are part of the Michigan Islands National Wildlife Refuge. There are automated lighthouses on Middle Island and Thunder Bay Island. Glaciers shaped the area, creating a unique regional ecosystem. A large portion of the area is so-called Grayling outwash plain, consisting of broad outwash plain including sandy ice-disintegration ridges; jack pine barrens, some white pine-red pine forest, and northern hardwood forests. Large lakes were created by glacial action. Some of the inland lakes are truly massive. US 23 serves Alpena on its way along the Lake Huron shoreline. To the north, it passes past Long Lake and Grand Lake, thence to Rogers City, Michigan, through Cheboygan, Michigan, and on to Mackinaw City, Michigan, where it ends and connects to I-75 and the Mackinac Bridge. M-32 ends its 100 mile (161 km) easterly cross-peninsular route from Lake Michigan to Lake Huron within downtown Alpena at the intersection of US 23. M-65 is a more direct route to the south than US-23, which meanders along the lake shore through many villages and towns. M-65 goes north to Rogers City. As of the 2000 census, there were 31,314 people, 12,818 households, and 8,690 families residing in the county. The population density was 54 /sq mi (21 /km2). There were 15,289 housing units at an average density of 27 /sq mi (10 /km2). The racial makeup of the county was 98.21% White, 0.25% Black or African American, 0.39% Native American, 0.33% Asian, 0.12% from other races, and 0.70% from two or more races. 0.58% of the population were Hispanic or Latino of any race. 24.9% were of German, 23.2% Polish, 9.6% French, 6.9% English, 6.5% American and 5.8% Irish ancestry according to Census 2000. 96.7% spoke English and 1.1% German as their first language. There were 12,818 households out of which 29.40% had children under the age of 18 living with them, 55.30% were married couples living together, 9.00% had a female householder with no husband present, and 32.20% were non-families. 27.80% of all households were made up of individuals and 13.30% had someone living alone who was 65 years of age or older. The average household size was 2.40 and the average family size was 2.93. In the county the population was spread out with 23.70% under the age of 18, 7.80% from 18 to 24, 26.50% from 25 to 44, 24.90% from 45 to 64, and 17.10% who were 65 years of age or older. The median age was 40 years. For every 100 females there were 94.60 males. For every 100 females age 18 and over, there were 92.50 males. The median income for a household in the county was $34,177, and the median income for a family was $42,366. Males had a median income of $34,571 versus $21,962 for females. The per capita income for the county was $17,566. About 7.70% of families and 10.50% of the population were below the poverty line, including 13.10% of those under age 18 and 6.80% of those age 65 or over. There are many recurring local activities. Alpena Earth Day Celebration, April 22. Location in Alpena varies. Food, games. Besser Museum Log Cabin Day, last Sunday in June. Approved by the Michigan legislature passed a bill to make Log Cabin Day an annual event to be held on the last Sunday in June. The Besser Museum for Northeast Michigan spotlights their own two log cabins on this day and celebrates by offering old fashioned, family activities. Great Lakes Lighthouse Festival, second weekend in October. Lafarge Downtown Alpena Riverfest, in mid-June. Family event centered on the Thundre Bay River, celebrating Alpena's lumbering history. Professional lumberjack shows, entertainment, music, storytelling, chainsaw carving, food, and games. Sunrise Side Heritage Bike Ride, Second weekend in September. Ride Along Lake Huron Shoreline (US - 23) to Mackinac Bridge then South to West Branch (M-33). Thunder Bay Arts Council's "Art on the Bay" at beautiful Bay View Park in Alpena. A Juried Fine Arts and Fine Crafts Fair which coincides with The Michigan Brown Trout Festival. There are over one Hundred and Fifty Artist will fill more than 180 booths with their original artwork. Thunder Bay Maritime Festival takes place at 500 W. Fletcher Street, Alpena, MI. 49707. It is presented by the Thunder Bay National Marine Sanctuary and Underwater Preserve. The Besser Museum and Planetarium. Thunder Bay National Marine Sanctuary. Alpena County is part of the Roman Catholic Diocese of Gaylord. The Alpena News is the daily newspaper of record for much of Northeast lower peninsula of Michigan. For a complete list of other media, see Alpena, Michigan. This page uses content from the English language Wikipedia. The original content was at Alpena County, Michigan. The list of authors can be seen in the page history. As with this Familypedia wiki, the content of Wikipedia is available under the Creative Commons License.